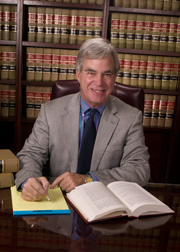 Bill Black has been practicing law for over twenty-five years. In that time, he has earned the respect and admiration of his peers, based upon the success which he has achieved in his professional and personal life. He is a native of Minneapolis, Minnesota, but has enjoyed living and working in Phoenix since 1979. He did his undergraduate work at Northwestern University in Evanston, Illinois and then attended and graduated from the University of Wisconsin Law School in Madison, Wisconsin. He is licensed to practice law in the state and federal courts in Arizona, Minnesota and Wisconsin and in the United States Ninth Circuit Court of Appeals. During the last several years, Mr. Black has been a member of the State Bars of Arizona, Minnesota and Wisconsin, the Phoenix Trial Lawyers Association (Past President and Board of Directors Member), the Arizona Trial Lawyers Association (Past Board of Directors Member), American Association for Justice, the American Bar Association, the Maricopa County Bar Association and the National Association of Elder Law Attorneys. He has been a member of the Torts and Insurance Practice, Business Law and Entertainment Law Sections of the American Bar Association and served as the Chair of the Business Law Section of the Arizona State Bar in 2002. He has served on the Executive Council of the State Bar Business Law Section from 2000 to the present and from 2004 through 2006 was a contributing editor to the Arizona Business Lawyer. He currently is the executive director of the Arizona Entrepreneur Advisor. He has also appeared as a legal expert several times on Phoenix local TV news telecasts.